Steam milk with milk thermometer to prevent scalding. 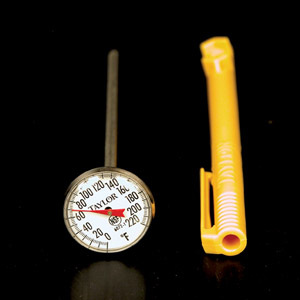 The sensor on the thermometer is near the tip for easy temperature reading. Steam your milk to 160 degrees F.
Milk expands rapidly as it nears its boiling point, so it’s best to start with a frothing pitcher that has enough room to allow cold milk to expand up to three times its starting volume.